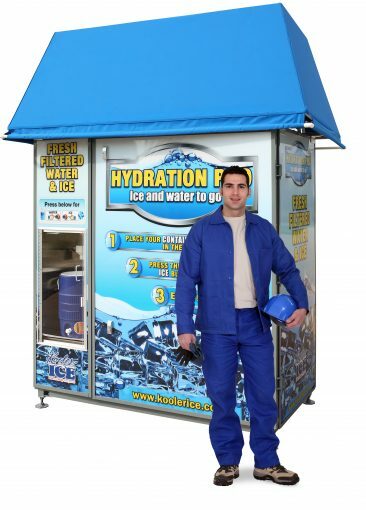 The HYDRATION PRO is an industrial strength ice and water dispensing machine that is built to last! It can be placed outside or inside your facility and connected to your existing water and electrical supply to produce an unlimited supply of fresh filtered water and up to 1900lbs of ice daily. Outdoors or indoors – the Hydration Pro can go outdoors where ice is usually required providing better access to everyone and cutting down on trips to get ice and water. Affordable – the Hydration Pro can be financed for as little as $449.00 per month! High Quality Clean Safe Ice – the Hydration Pro is a closed system. The ice and water are dispensed, there are no scoops or ice buckets required. Just push the button and get safe, clean, high quality ice and water. Purified Water – the Hydration Pro comes standard with filtered water, however, an optional Reverse Osmosis system can be added to provide purified ice and water. Bagging Attachment – bag your own ice with the bagging attachment and transport ice in and around your facility providing you pre-packaged ice for larger events or venues. To operate the unit, simply push a button to automatically receive ice, and push another button to get water. The machine can accommodate many different sizes of containers and the product will flow into the container continuously until the button is released; allowing users to fill their personal containers quickly and easily. Oversized containers can be filled quickly and efficiently and the ice to water ratio can be controlled by the user making it ideal for industries that anticipate the need for high volume water supply needs. View the video below to see just how it works. The HYDRATION PRO eliminates need to order and manage ice and water supplies, schedule and accept deliveries of ice and water, or arrange for storage of these supplies. And, the cost over time for the machine is far less than retail pricing and is far more cost and time efficient than purchasing ice/water through a traditional vendor. The machine was designed to be energy efficient and reliable, so it is ready to use whenever you need ice or water – without waiting. It will save Employers time and money while improving employee well-being and safety. Easy Push Button Controls - There is no vending on this machine. Simply push one button for Ice and one button for Water and the product will flow continuously until the button is released. Adjustable Flow Tube – The machine allows for different size containers to be used. Simply raise and lower the tube dependent upon the container you are using. Enclosed Serving Compartment – The clear plastic door is designed to help keep contaminants out of the water and ice service area. “IceTalkTM” Machine Management System – The unit comes standard with our proprietary remote access monitoring system. This system will monitor important machine functions from your smart phone, iPad or laptop and will send alerts should there be any issues with the machine. Designed for Indoor or Outdoor Use – The unit is durable enough to be placed outdoors, but can also be used in an indoor application – the choice is up to you. Environmentally Friendly - Because the ice is made on site and on demand, there is no waste of the earth’s valuable resources, no toxic emissions bringing the product to you, and no residual harmful waste products. In addition, because the units do not require refrigeration to keep the ice frozen, it has lower utility demands as well. It naturally supports the “Living Green” philosophy. Sump Well with Sump Pump – To easily remove drain water away from the machine. Lexan Graphics – To give the machine a clean, neat, professional appearance. Frame is constructed with high strength, corrosion-free Aluminum Alloy. Insulated Storage Bin which is made from food grade, molded plastic. Bin Storage Capacity: Up to 450-500lbs depending on the ice maker selected. Multiple Ice Maker Options – Owners may select from a choice of four different Scotsman Ice Maker options so you can design your machine based on your production requirements and the number of employees/people using the machine. Would you like to hear from us? * Would you like to hear from us? *I am very interested! Please call me ASAP!I am interested. Please call me in the next few days.I am just researching. Please give me a call in the next week.I will call you if I have questions.